The meeting in Ufa is being heralded as a breakthrough by India’s ruling Bharatiya Janata Party (BJP), but we’ve seen this story before. 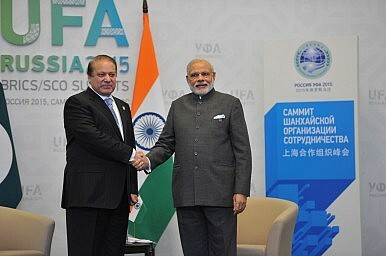 In concrete terms, the Modi-Sharif meeting in Ufa had a clear list of outcomes. The most contentious is the announcement that Modi will head to Islamabad next year on the occasion of the 19th SAARC Summit. If that visit goes through, it will mark the first time an Indian Prime Minister has traveled to Pakistan since Modi’s BJP predecessor, Atal Behari Vajpayee, did so in 2004. It appears that Modi’s intention to go to Islamabad has not been linked to any broader issues in the relationship, such as Pakistan’s treatment of the terrorists who masterminded the devastating November 26, 2008 terror attacks in Mumbai that killed over 150, including Zaki-ur-Rehman Lakhvi. In addition to Modi’s plans to visit Pakistan, the two leaders issued a joint statement. The joint statement laid out five steps “to be taken by the two sides,” including a meeting of their national security advisers to be held in New Delhi to discuss terrorism, a meeting of the director generals of India’s Border Security Force and Pakistan’s Rangers followed by a meeting of their respective Director-Generals of Military Operations (DGMOS). Meetings between the DGMOs of the two countries are rare and the last one took place in December 2013–as I wrote in The Diplomat then, the DGMOs meeting back then proved rather hollow and disappointing. Modi and Sharif additionally set out to release arrested fishermen, a regular and mundane show of goodwill at this point. A fourth step noted that the two would work to establish mechanisms “for facilitating religious tourism,” with little additional detail. The final step noted that the two leaders had agreed that the Mumbai terror attacks case trial needed to be expedited. An additional point of interest with this meeting is the claim being made by senior officials in the BJP that Pakistan has agreed to India’s definition of terrorism. Indian leaders have long criticized Pakistan for distinguishing between “good” (or useful) terrorists and “bad” terrorists (the kind that terrorize the Pakistani state and polity).”Both sides condemned terrorism in all its forms and agreed to cooperate with each other to eliminate the menace of terrorism from South Asia,” Pakistani Foreign Secretary Aizaz Ahmad Chaudhry said in a statement after the prime minister’s meeting. The BJP’s MJ Akbar took this statement to mean that Pakistan has come around to the Indian definition of terrorism: “For the first time Pakistan has accepted to combat terrorism in ‘all its forms’,” he said. I remain skeptical that this meeting, or the steps laid out in the joint statement, will be sufficient to cause any real momentum leading toward an improvement in the overall state of India-Pakistan relations. Part of the reason lays in the fact that Sharif and Pakistan’s civilian leadership don’t hold a controlling stake in Pakistan’s foreign and security policy. Ultimately, elites within Pakistan’s military-intelligence community, the same forces that have historically worked to spoil any budding rapprochement between the two countries, have a greater say over the direction of this relationship than Sharif’s government. As I said, we’ve seen this story before: Sharif and Modi are veterans at shaking each other’s hands and posing for photo ops, but the realities along the Line of Control and Pakistan’s treatment of cross-border terror and sub-conventional warfare remain static. As much as I’d love to be proven wrong regarding my skepticism, there’s little in the Ufa encounter that suggests real change may be on the horizon. Can We Trust the New Dialogue Between India and Pakistan? Narendra Modi and Nawaz Sharif are speaking again. Is this a good development?